1 of 4 Heat oven to 350 degrees F. Line an 8-inch square baking dish with foil so it hangs over sides; coat foil with nonstick cooking spray and set aside. 2 of 4 In a small bowl, blend flour, cocoa, baking powder and salt. 3 of 4 In a medium-size microwave-safe bowl, microwave chocolate and butter for 40 seconds until melted, stirring halfway through. Stir until smooth, heating in 15 second increments if needed. Cool 2 minutes, then whisk in sour cream, chocolate syrup, vanilla, egg, egg white and sugar. Stir in flour mixture. 4 of 4 Spread batter into prepared pan and bake at 350 degrees F. for 25 to 28 minutes or until a toothpick inserted in the center comes out clean. Remove brownie from pan using foil handles. 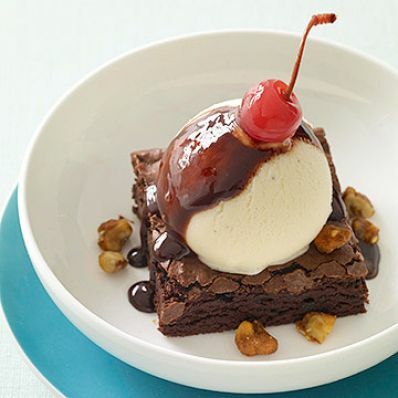 Cut into squares and top each with 1 scoop frozen yogurt, drizzle with chocolate sauce and finish with chopped nuts and cherry, if desired. Makes 9 servings.